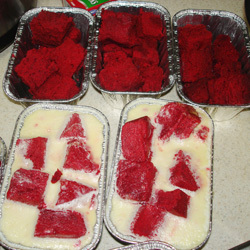 Ohhh The Bittersweet-ness Of RED VELVET BREAD PUDDING! Al and I didn’t get out of bed till about 10 am. A little too late for baking Red Velvet Bread Pudding, stirring up “Pastica de Jamón” (the appetizer we chose from our cookbook), and still hoping to get out of the house by 2:30. But in usual Kat and Al fashion, we buckled up and into the kitchen we went. Okay before I go any further I need to clarify that last statement. I WENT INTO THE KITCHEN! Al went to Toy R’ us to get last minute gifts for my two little cousins and his niece (I’ll forgive him on this one). As soon as we hung up I let out a huge sigh of relief! “Ahhh, thank god,” I told myself. Being that my little Brujis makes the best, I mean the best, Red Velvet cake I knew the stars had aligned and her best friend’s intuition had kicked in. She was running over to rescue me, what else could this possibly mean!! Okay, maybe it didn’t quite happen that way but a girl can dream. I guess the only thing left to say is that I’m soooooo glad David needed to urgently wrap those gifts, precisely at the time I was starting out on my adventure. When she arrived, I was already in the mist of the chaos. She had a few pointers to give me (much needed ones of course). Like, that apparently the only measuring cup I own is a “wet measuring cup.” Christine’s exact words, not mine. Maybe it’s only me, but really there’s a difference?! Who the hell knew that there were dry & wet measuring cups? Isn’t a cup, 8oz regardless what container you are using? Apparently not! So here goes yet another note to self: Get dry measuring cups! By the time she left an hour and half had elapsed and I was putting my red velvet cake into the oven. Next on the agenda, the bread pudding mix and the only simple thing about this recipe! It wasn’t till this was all completed and the last thirty minutes of baking were well on there way, when Al arrived. He had made it just in time to lick the spoon and wait for the oven to go ding and basically scream that it was done! The RED VELVET BREAD PUDDING WAS FINALLY COMPLETED! Being self proclaimed foodies, we were so so excited that we didn’t even wait for it to cool off before our paws were all over it. The first couple of bites were to die for BUUUTTT after that fourth bite, it was just too much! I mean it was so intense and sweet that I thought maybe I didn’t need that bigger slice of heaven after all (refer to my last blog). 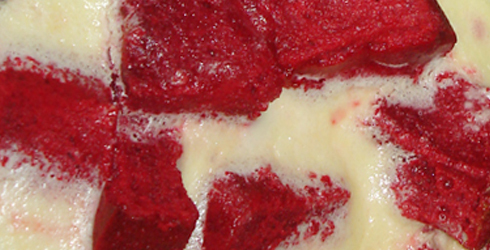 In retrospect I’m sticking to the traditional red velvet cake, Christine’s that is! Oh that reminds one more note to self and surely not the last: Get her to come over and teach me how to make that damn red velvet cake! Stay tuned, for the Pastica de Jamón adventure, not the success I wanted it to be either! Oh man, it’s been a rough day! So, from our kitchen to yours let the cooking escapades continue! *Brujis- I will use this a lot as it is my term of endearment for my best friend Christine. I’ve been calling her that since our days in high school and although I don’t want to even think that it’s been a long time, I must admit that it has! Oh the good old days!